The easyJet founder has opened a pilot store to cater for 'the less well-off'. As the supermarket price war continues to rage on – Morrisons just slashed the price of more than 1,000 products – easyJet’s founder is now trying to muscle in on the action. 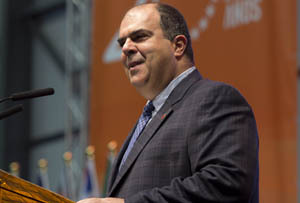 Stelios Haji-Ioannou has finally launched his much discussed easyFoodstore shop, which is selling all of its items for 25p for the first month. A canny PR stunt or a robust challenge to Aldi and Lidl’s rapid encroachment on the supermarket stalwarts? The budget grocery sector is highly competitive and the German discounters have shown consumers can be tempted from the old names with consistently good offers – doubling their market share in three years to 10%. So how is Haji-Ioannou going to out-Aldi Aldi? The easyFoodstore products – including orange juice, mixed vegetables, sardines, soup, spaghetti and chocolate – are unbranded and the tagline is ‘No expensive brands, just food honestly priced’. The store itself displays the bare bones merchandising of a cash and carry, though there have been even less impressed musings across Twitter – one suggested it resembled a Soviet era shop (though considerably better stocked). The pilot shop in London’s Park Royal has been a long time coming – plans to open in Croydon were brought to a halt last year after planning permission was denied. Not one to cry over spilt milk, Haji-Ioannou instead used the site to test a mock-up of his idea with target customers and retail analysts. Bargain hunters will surely take to the easyFoodstore with gusto – at least while this February 25p offer runs. Prices after that period haven’t been announced (though last year Haji-Ioannou said he wanted to keep an average of 50p across the product range), but they’d still have to be eye-catchingly low to offer a distinct enough range from the German discounters. Whether they’ll be enough to keep customers coming back – particularly with the no-brand factor – remains to be seen. Discounting at this level also comes at a cost to somebody – suppliers are likely to be squeezed even more in an increasingly tense price war and last year Haji-Ioannou was cagey when asked if staff would be paid more than the minimum wage. ‘I know that is the soundbite you want but we will have to see,’ he told the Guardian. Keeping costs down will be a necessity for easyFoodstore and on the surface this may seem like a nifty way to fill a gap in the food retail market below the likes of Aldi and Lidl. Stelios has said it’s ‘another way the easy brand can serve the less well-off’. We'll have to see whether customers consider this one step too far in the race to the bottom though.